Concert poster design is where my two main interests in life dovetail. I have been playing guitar and vocals in bands since 1998. I have also booked bands for countless shows and festivals. 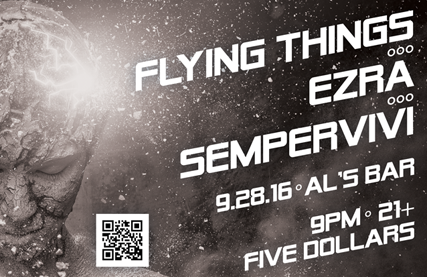 My responsibilities include designing flyers to promote concerts. I also often print and distribute them myself. It’s a very important part of being a successful DIY independent artist. 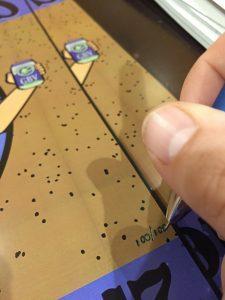 I love to create full color, large format printed posters. It is very fulfilling to find the right visual image for an upcoming gig. Sometimes, I like to create black and white handbill variations. They can also be effective promotional tools. Are you in a music group that has a big local show or festival gig coming up? Perhaps you are a regional or national concert promoter looking for the perfect poster designer. Contact me for a striking design to promote your event. 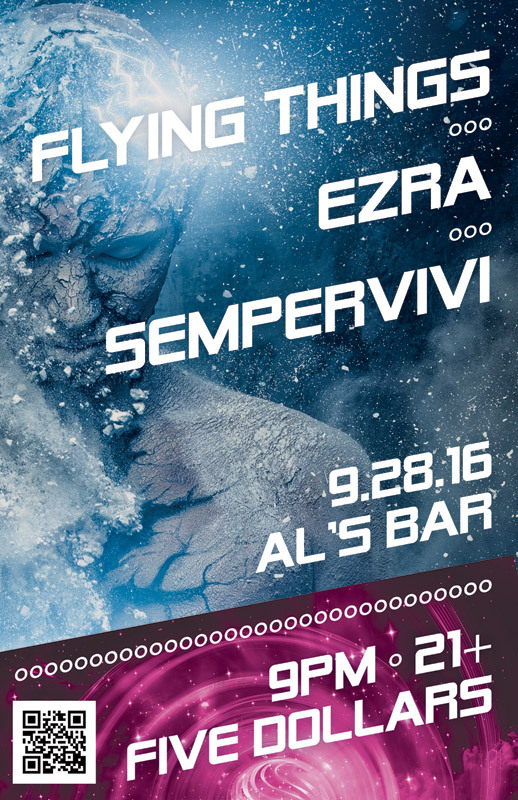 This 11×17″ band poster design hypes a show featuring indie rock bands Ezra and Flying Things at Lexington, KY venue Al’s Bar. Al’s is otherwise known as “The Greatest Bar of All Time”. I also opened up this show solo with my music project Sempervivi. I started with two psychedelic stock images. This theme fit the headlining bands’ sounds, which invoke fantasy imagery. I recolored the photo of the grungy space boy in a cool blue. The pink swirl at the bottom began as a full color image. Then I combined them for a futuristic feel. The white text uses a futuristic, easy to read sans serif. It tilts up at an angle so the information will stand out amidst the chaos in the poster’s background. I created a QR code and linked it to the event page on Facebook, so fans could RSVP with their phones easily. Finally, I sized down and rearranged the elements into a half page sized handbill. 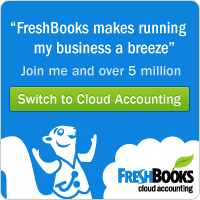 I firmly believe that you don’t necessarily have to spend a ton of money to promote. Black and white handbills are old fashioned. Many people balk at them. However, one more inexpensive way to get your event in front of more eyes can’t hurt. I printed the posters and hung them in the North Lime neighborhood where Al’s is located, while Flying Things passed out the handbill version at their school. We all worked hard together and got the word out about the show. Therefore, there was a great crowd at the show, especially for a weeknight in Lexington. Do you play in an independent band? Are you a solo musician that needs some promotional art? Contact me for a rad poster design. 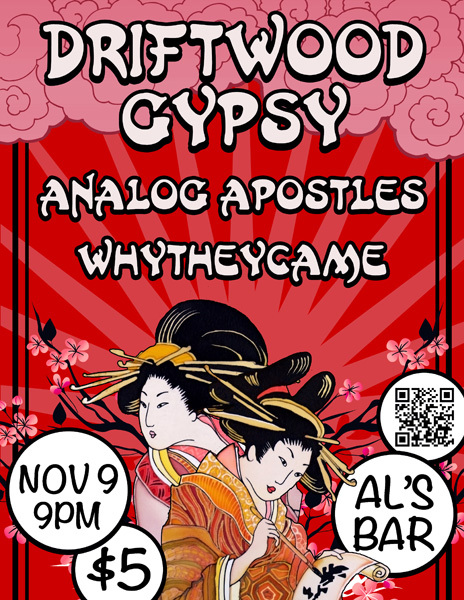 Driftwood Gypsy is a popular jam band based here in Lexington, Kentucky. I played in an alternative indie rock band at the time named Analog Apostles. We shared the stage at this event with them and my friends from Owensboro band Why They Came at local pub Al’s Bar. I had never used an Ancient Japan theme before. Therefore, I thought it would be fun to incorporate one in the concert poster graphic design. First, I sought out some royalty-free Japanese illustrations for the collage. These included two geisha girls from ancient paintings, which came together to form the foreground focal image. I also added branches from two hibiscus trees with pink cherry blossoms behind them. Pink clouds roll peacefully in the upper section behind the headlining band’s name. I had set the stage for the information in the foreground. I set each of the band names in a bold white specialty font with an Asian style. Also, I heavily stroked and shadowed the text for contrast against the bright red background. I wrote the other information about the gig in a fine brush font. I intended for the large white floating bubbles which contain the text, as well as the QR code, to mimic paper lanterns. Many of the attendees of the gig complimented me on the eye-catching pop art qualities of this flyer. The end result was a composition that is striking, yet also displays an air of both calmness and serenity. This show had a great crowd. I certainly am not taking all of the credit for the attendance number. However, it certainly did not hurt that I printed and posted this concert poster graphic design all around the neighborhood. Are you a band or perhaps a promoter seeking poster design for your events? Contact me today to get started. Pick it up! The Rough Customers are Lexington, KY’s only third wave ska band – as far as we know! 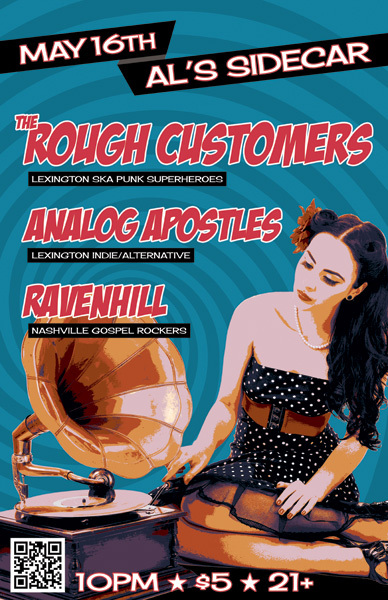 In 2014, my band at the time Analog Apostles performed with them and Nashville, TN soul rockers Ravenhill. Ravenhill made a tour stop in Lexington at the Sidecar, next door to Al’s Bar. The Rough Customers’ live show is all about fun, and that’s the vibe I was going for with this concert poster design. The featured photo of the classic pin-up girl and phonograph was given a “washed out” effect, which I made by reducing the colors using Adobe Illustrator. I then added the hypnotizing bright blue swirl in the background to enhance the kitsch factor. I lettered the bands’ names in a watermelon red using the retro “Badaboom” font, since it always signals good times. Additionally, I used the “Cherry Cream Soda” font for the other text, completing the poster’s vintage 50s feel. Finally, I added a QR code to the concert poster design so that potential concert goers could RSVP to the event on Facebook by scanning the poster with their smartphones. The Rough Customers never disappoint when they take the stage, and always draw a big crowd. This show was definitely no different, since we filled the small room to capacity. I would like to think that my eye catching design helped with that aspect. 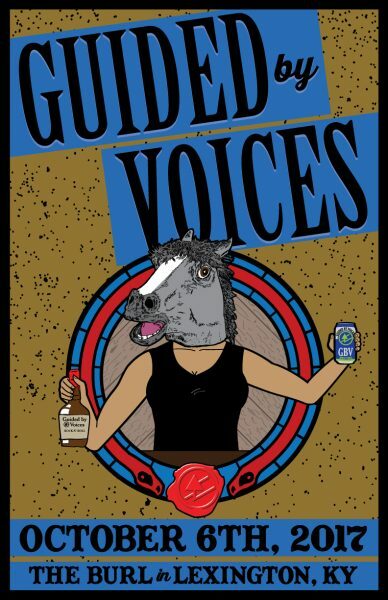 I always design and print my 11×17″ posters to promote shows and other events that I put together. The large format gives me more canvas to play with. It is also more eye catching than a letter sized flyer when hung in store windows. Are you a musician or band needing a concert poster design? Contact me! The United States and China are leading exporters of peanut butter.